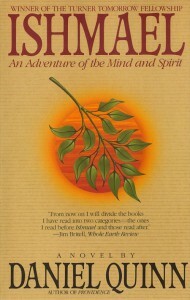 Ishmael: An Adventure of the Mind and Spirit, Daniel Quinn, Bantam, 1995 (c1992), ISBN 0-553-37540-7, $10.95, 263pp. This was a selection from Jill’s library, a recent favorite of hers. Truthfully, there’s not much story here, but it doesn’t matter because what is important here are the ideas. Basically, Ishmael is a discussion about our culture, how we use the Earth and how our culture is different from past culture and modern agrarian cultures. This may seem too “back to nature” for some folk, and as someone who likes technology in as much as I do it may seem strange that I took to this so easily. But the case is made cleverly, and it follows some of my own observations regarding religion and culture. The manner in which the story is told–as a conversation between a most unusual teacher and the narrator pupil–is as old as the Coliseum. The teacher elaborates, trying to get the pupil to ask the right questions. This format was frustrating to me at times, as I felt that there was a lot of needless repetition. This is likely because Quinn wants to make sure that his underlying assumptions (or “points”) are clearly understood before he starts the argument and rational conclusion that is the purpose of the book. I don’t agree with everything here. I hold this weird belief that information is the opposite of entropy, and I do not think that we have halted evolution one bit (modified its effect on us, yes, and possibly for the worse). But Quinn’s goal is to make you think, to make you examine those underlying assumptions, and if you are discussing it, at least half his purpose is achieved. 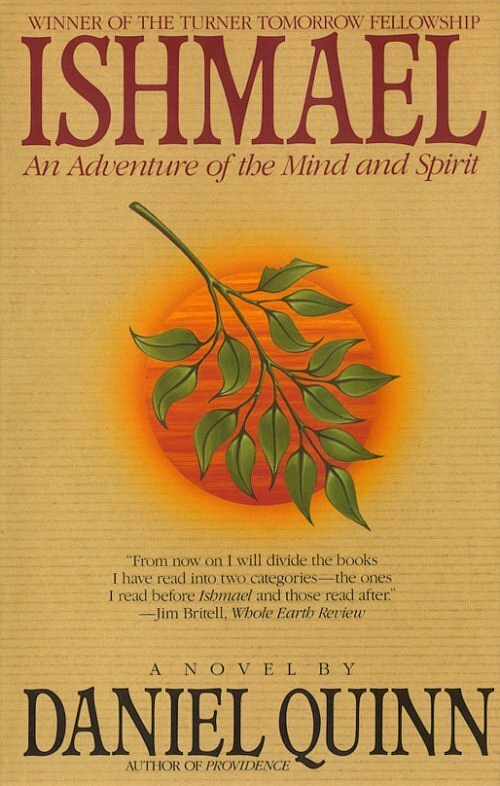 One of the blurbs here says that the blurb-writer now divides his reading into two groups–books read before reading Ishmael and those read after. I wouldn’t go that far. However, I do find that it informs some of my reading since, and that’s about the best recommendation you can give any book.